Growing a mustache can be tricky, time-consuming and for some, a rather complex task. Keeping it intact, on the other hand, is much simpler. Unless of course, you’re playing Mustache Ride, in which every shaving utensil known to man (get it?) is out to trim that fancy facial hair. Now, a lot of games walk the fine line between ‘weirdly entertaining’ and ‘what the heck did I just play?’, and if not for the comedy factor, I’d likely place this endless runner amongst the latter. But somehow, the basic concept of repeatedly tapping a button to control altitude, actually makes for some arcade-y fun here. Or maybe it’s just that playing as an ant, piloting a mustache, is the right kind of crazy. Whatever the case, it’s definitely more fun than most genre entries I’ve played (free and premium). It does lack some sort of progression system though, meaning that those not satisfied with simply riding the combo-train for a high score, might find themselves bored after a few minutes. I love mustaches and bugs and was wondering how to make a game about both, and somehow it turned into a reality as my first game. That said, there are a bunch of collectables in the form of, well, unique mustaches, awarded for accomplishing daring feats and such. Not my cup of tea, but I know for a fact that a lot of people take pleasure in collecting virtual trophies which are only used for bragging rights. Oh and should you feel like socializing, there’s always the cafe. Although unless I’m mistaken, there isn’t much to do there until after you’ve racked up quite a lot of points and/or unlocked a mustache or two. Not that you should be chatting with the locals anyway, when there’s flying to do! 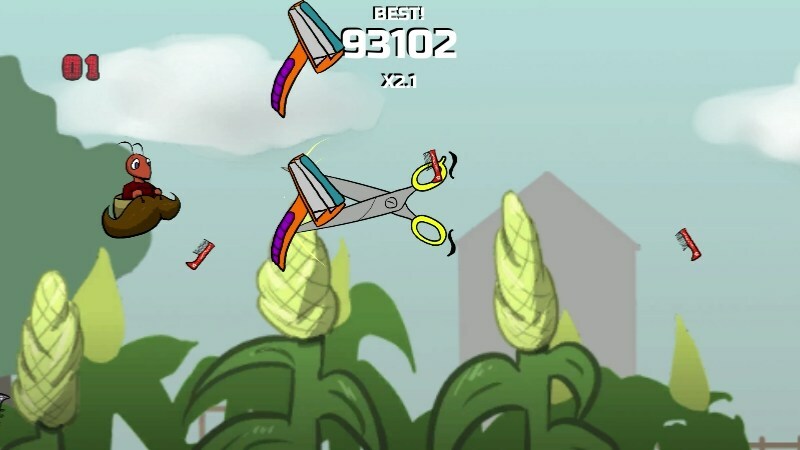 So, feel like flying through the sky, dodging scissors, razors and other hazardous (to a mustache, that is) objects? Then by all means, do take Mustache Ride for a spin! Windows Phone Store and browser version available, both of which are 100% donation-based.